I was at the beach once and I see this crowd of people walking along the shore. A very large crowd and it was coming my way. They were looking at something in the water. I got up and went to see what the commotion was. People were following a dead dolphin that was washing down the shore. This went on for as long as I could see the crowd. Yet here we have a dinosaur with no interest. I dont see a dorsal fin though. For some reason the video won't work for me. Maybe it's a weather balloon or swamp gas? And what in tarnation did the need to blur out of the foreground by its belly? To be fair, my points still stand. What would YOU have done if you'd found it? Anyone posting here is well aware of cryptozoology and the value of finding such a specimen. The idea that you'd film a bit and stroll away from what is essentially a winning lottery ticket is complete and utter BS. I'd stay by that thing 24-7 until I got news media, tissue samples, etc etc etc. all taken. I was wondering the same thing. Guts? Only one fin? They had 4. Here you go, and no blurring. Looks like it's suppose to be guts. As mentioned, if it was a plesiosaur, why only one fin? It should have 4. The tip of the tail doesn't exactly look like that of a plesiosaur either. It's said the thing is about 5 foot long. I don't know what it is and am not going to guess. However, some here forget that once a creature dies in the ocean, fish usually begin to feed on it. Fins and other parts can easily be bitten off by other creatures including sharks making it look quite different than it did when it was alive and before it washes up on shore. Last edited by marino760; 03-28-2018 at 05:23 AM..
Good point. 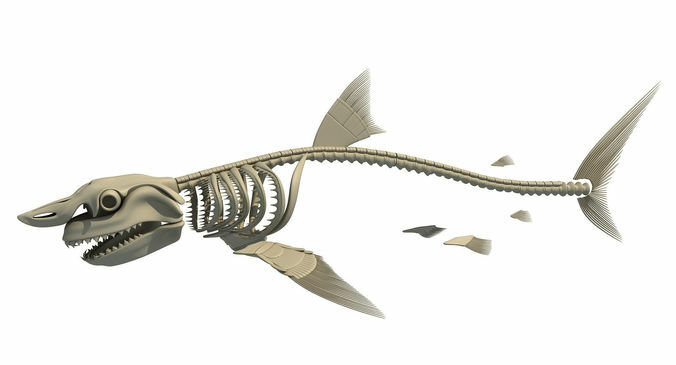 If you look at a shark skeleton, if you loose most of the abdomen flesh and the mouth/jaw bones, it looks very much like what is shown in the video. O, I agree completely. Except that if it's fresh enough to the point where there are red guts hanging out that they have to blur, wouldn't you expect the places where the appendages had been torn off or were eaten to be visible?